It is hard to believe another summer is coming to a close. Lynn and I will be leaving Colorado shortly to return to Arizona for the winter. If any of you are in the Scottsdale area this winter, be sure to call and stop by. You should be receiving an EMAIL from Tresa Smith about membership renewal. For 2011, LIFETIME members and all paid 2011 members will receive a USMMA T-shirt with the new USMMA logo if you renew by year-end. On a sad note, Lucas Guerra, founder of MM Horse Farms, and the first importer of Mangalarga Marchadors to the USA, recently passed away in August. Lynn and I were fortunate to have spent time with Mr. Guerra and his wonderful family both in Florida and in Brazil. The Guerra family hosted our first trip to Brazil during the 2002 Nationals. We visited many farms, including the fazenda of Mario Lucio Borges, who was a fine breeder and a visionary for the Marchador breed. We will always be grateful to Lucas Guerra for starting us on our wonderful journey with theMangalarga Marchador. In his memory, I will be asking the USMMA Board to name our National Championship trophy after him. I am hoping to have a National Show during my Presidency. I have sent to all members a separate EMAIL which contains the first in a series of articles Tresa Smith is organizing with all of the US farms that have imported Marchadors from Brazil. This first article was authored by Cristiana Guerra, Lucas's daughter, which focuses on their MM Horse Farms. Tresa Smith and Lynn Kelley collaborate to edit and to add their contributions to the history as well in each chapter. In the months ahead we plan to cover all of the farms that are responsible for bringing the Marchador to the USA. I hope you enjoy learning more about the specific breeding lines that are represented here. Although the USMMA and the Marchador have a short history in North America. It represents a strong tie with the a rich Brazilian tradition. I am very grateful that Tresa Smith has agreed to take the lead in documenting the importation and foundation stock of the USMMA. To give you some perspective on this first article and future ones to come, here are some of the numbers to whet your appetite. 72 live Marchadors have been imported from Brasil (additional horses were imported in-utero). The oldest import is a mare born in 1982 - Formosa do Crocoto. 26 were stud colts or stallions. Of these, only 11 are still breeding. 37 mares were imported to become foundation breeding mares in 11 states with 14 breeders. 6 horses were imported as geldings. The Guerra family in FL - MM Horse Farms. The foundation horses represented a great mix of bloodlines. Abaiba, Tabatinga, Favacho, Bela Cruz, Herdade, JB, Traituba, Caxambu and more. Some of the imported mares were pregnant to Brasilian stallions further adding to the genetic pool if their foals remained breeding animals. All of the other Marchadors found around the country are products of these original horses. Looking for a volunteer(s) to research and select a new registration software package and to learn the rules and procedures of registration. Once trained, then you would be eligible for appointment as Registrar by the USMMA President. Ideally, at least 2 people would always be ready to fill this vital role. There are 188 known Marchadors in the US and Canada. 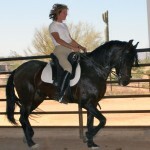 Two new states received their first Marchador horse in August - Missouri and New York. Aja Bajoni do Premier is now in Missouri and Bella Duquesa do MManor shipped to New York. Of great excitement to me, I found a new Mangalarga Marchador in TX. 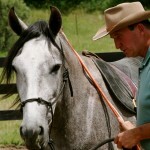 A grey gelding came home with the family around 2001 when they returned to the US from Brasil. In August, 5 foals were registered and 1 horse transferred ownership. We expect 11 of the 2010 foals to be registered this fall which will bring the number to 173 registered Marchadors or 92%. The 2010 ABCCMM Inspection visit was completed in August. Twelve Mangalarga Marchador horses and 8 USMMA members participated. Most of the horses were breeding mares, but 3 geldings were also inspected. Horses that pass the tests for conformation, riding and temperament are branded with the trademarked ABCCMM Horseshoe M brand and are dual registered with the USMMA and the ABCCMM. The 2008 ABCCMM inspection DVD was mailed to all USMMA members as a thank you for renewal. During this visit, Dr. Getulio Vieira, the expert Brasilian technician, scored the horse's conformation with participants and also gave a riding lesson on the march. Both of these sessions were filmed so perhaps we will have more educational material soon. Congratulations to the owners and horses! Everyone passed! We have received reports that the USMMA website may not be displaying all of the pages that are there using the webbrowser Internet Explorer. Because we are working on creating a new USMMA website, we may not pay to fix this problem which seems to happen every time Internet Explorer changes. Please accept my apology and try using an alternate webbrowser like SAFARI (Apple), Google Chrome (free) or FireFox (free). Please send news, stories, information and articles to be included in the newsletter to [email protected] It's vital that we keep our community strong by sharing what we're doing and how we're doing, so please send in anything you'd like to share. Not only can you keep up with us on a day to day basis, there are fantastic resources for you like a photo album featuring members photos, photos of the USMMA Board of Directors, and photos of horses in Brazil that we think are worth noting, plus there is a discussion forum where we post topics for conversation, articles, and other interesting tidbits that don't really fit in our newsletter. October 2, 2010 in Newsletter, Presidents Letter.